Kobi Halperin "Carin" silk blouse. EXCLUSIVELY AT NEIMAN MARCUS Co silk blouse with hats on faces prints. Gathered, jewel neckline ties at back. Long, blouson sleeves; button cuffs. Easy silhouette. Slipover style. Imported. Model's measurements: Height 5'10.5"/179cm, bust 32"/81cm, waist 25"/64cm, hips 35"/89cm, dress size US 2/4. 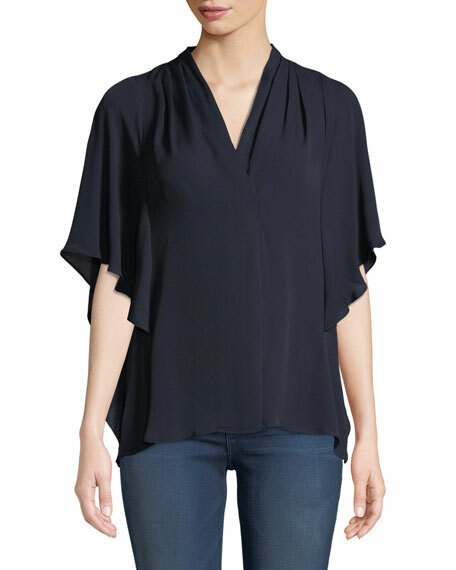 EXCLUSIVELY AT NEIMAN MARCUS Derek Lam 10 Crosby blouse in printed silk. Collarless neckline. Concealed button front. Long bell sleeves. 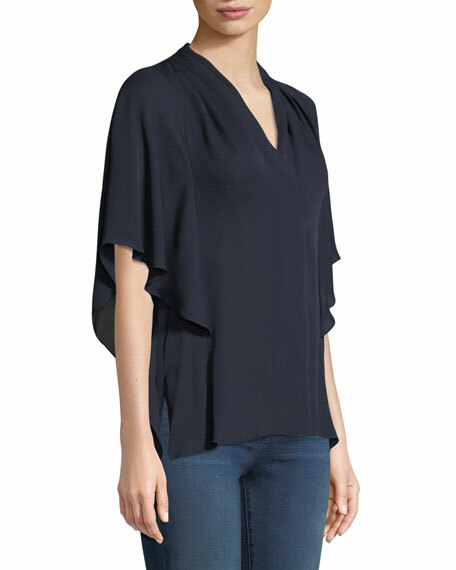 EXCLUSIVELY AT NEIMAN MARCUS Derek Lam 10 Crosby blouse in printed silk. Collarless neckline. Concealed button front. Long bell sleeves. Relaxed fit. Straight hem. Imported. Model's measurements: Height 5'10"/177cm, bust 33"/84cm, waist 25.6"/65.2cm, hips 35.8"/91cm, dress size US 2-4/FR 34-36. Elie Tahari "Asifa" silk blouse. Approx. 27"L down center back. Band collar; concealed button front. Long sleeves with button cuffs. Johnny Was "Bianca" blouse with metallic detailing. Boat neckline; keyhole front. Long bell sleeves. Swing silhouette. Silk/metallic fiber. Silk lining.